The Chi Counter Stool is the ideal stool for any dining, kitchen or bar area for its simplicity and its high-quality craftsmanship. 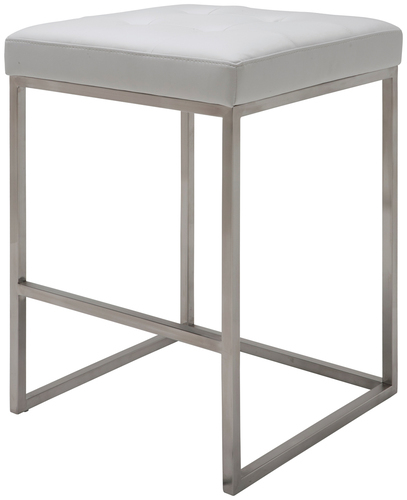 This modern designed counter stool is engineered using a solid brushed stainless steel frame and includes a footrest for added support. This comfortable and plush square seating is made using CFS foam, which is added for extra comfort and comes tufted and upholstered in Naugahyde leather, a fabric created to be easy to clean and maintain. The Chi Counter Stool comes in Black, White and Grey.